I read Schama's book "Citizens" on the French Revolution many years ago, and thought it was a very fine work. I also saw his History Of Britain narrated series back in the 90s. He had a very dry sense of humor, droll and ironic. Finally, in Oxford in 1996, I took a walking tour of Oxford with a guide who had just finished his graduate studies with Schama, or so he said. Simon Michael Schama, CBE (born 13 February 1945) is a British historian and art historian. He is a University Professor of History and Art History at Columbia University. He is best known for writing and hosting the 15-part BBC documentary series A History of Britain. Other works on history and art include The Embarrassment of Riches, Landscape and Memory, Dead Certainties, Rembrandt's Eyes, and his history of the French Revolution, Citizens. Schama is an art and cultural critic for The New Yorker. The son of Jewish parents with roots in Lithuania, Romania, and Turkey, Schama was born in London. A very interesting character indeed, I've lost count of the number of times that characters new to 9/11 research appear to have Jewish lineage. & nearly always East European. This guy is a strong defender of the existance of the State of Israel, and regards an attack of Israel to be an attack on Jews. What: Please join families of 9/11 victims as they announce the launch of their new organization, September Eleventh Families for Peaceful Tomorrows. A short presentation will be followed by a breakfast reception. And 14+ years on... still no justice for the "vicsim families" - how very demoralizing ! "Trials for 9/11 suspects languishing after 14 years"
Fourteen years 'n' counting - and they still haven't come up with actual prison-mugshots of the "Evil Arab Culprits"! Am I seeing that Sacha Baron Cohen clown at top left? Nah - can't be, can it ... I must imagine things ! 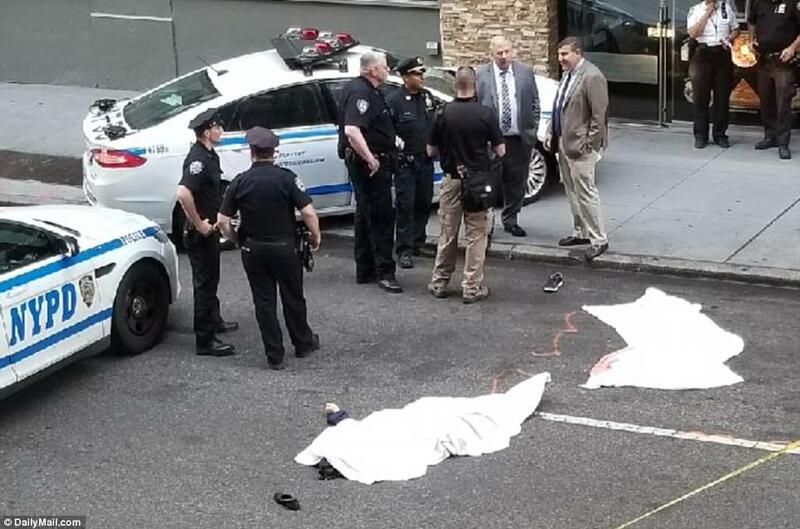 The couple who recently jumped from the 9th floor, to their deaths, on the corner of 33rd Street in Manhattan, have a connection to 9/11 (not just that they were jumpers ). It is interesting to learn, years later, of the teams of volunteer chiropractors who helped soothe the God-like firemen. They even found some pictures of him in action. Plus the usual touch of the shoe(s) that's come off, a symbol of helplessness and death, and the impression that nothing was there on the ground when the picture was taken. Gosh - dear pov, I don't think I've laughed just as heartily in a long while. Thanks !